Update: This guide is sorely outdated. If you please refer to this new guide instead : Install Signed 5.03 Hen + 5.03 GEN-C on your PSP. It’s much simpler to follow and will help you install 5.03 GEN-C and the Prometheus-4 module. This guide is for non-hackable PSPs. (PSP-3000 / PSP-2000 TA-088v3). If you’re not sure what PSP you have, please read: Is my PSP hackable? On this guide, we will help install 5.03 GEN-B on your PSP. There is no danger of bricking your PSP unless you deviate from the instructions listed below. Unlike custom firmware for hackable PSPs, the danger of bricking your PSP-3000 / PSP-2000 TA-088v3 is quite real. If you’re not sure about a step, take the time to post a question. Do note that if you have official firmware 5.50 or higher installed, stop now. You can’t install the chickHen hack which means you can’t install 5.03 GEN-B. Before you proceed to installing custom firmware 5.03 GEN-C, you need to install ChickHen R2 on your PSP first. Just click the picture on the right to install ChickHen R2 and comeback here to finish the installation. Make sure your PSP has ChickHen R2 installed. You won’t be able to install 5.03 GEN-B without it. Extract the 5.03 GEN-B files to your computer. Congratulations, you’ve just installed 5.03 GEN-B. Important Note: If this is NOT the first time that you’ll be install 5.03 GEN-B (meaning you accidentally turned off your PSP and had to reload 5.03 GEN-A -> 5.03 GEN-B again), hold the L trigger (Left shoulder button) when running the updater. Reading UMD / ISO games protected against the custom firmware. Playing UMD / ISO games protected against the custom firmware. All this is thanks to GENyUS and PSPGen.com. One of my PSP game just crash, and my PSP is back to official firmware 5.03. But when I tried to reinstall 5.03 GEN-B, nothing happens, it just remain at 5.03 GEN-A. Can anyone help me? Are you trying to install 5.03 GEN-B after 5.03 GEN-A or straight to 5.03 GEN-B? help pls i installed 5.03 gen B but i still cant play my iso games.. when i selected 1 game my screen goes blank.. I wanted to install the GEN-A 5.03 but I can’t open the Launch -Me (GUI) it shows: The application failed to initialize properly(0xc0000135). Click on OK to terminate the application. Please send the winzip file to my e-mail adress! You can’t install 5.03 because you already have 5.51 >_> you can’t downgrade without a pandora battery. -I formatted my Pro Stick Card and followed the same path that you wrote to install chicken+Gen-a+Gen-b, but I cannot install Gen-b now. I can just install Gen-A.!!! Look I’ve two psp’s, one is mine and the other one’s my brother’s, mine is 5.03, I installed chickHEN R2 , I zipped the gen-a folder to my desktop but when I double-clicked on the ‘launch-me (GUI)’ it shows: the application failed to initialize properly(0xc0000135). Click on OK to terminate the application. Same thing here, i had 5.03 gen-B updated, it worked great. then its still on 5.03 gen-A. Looks like the upgrade only works one time! I had the same problem. Just copy the 5.03GEN-B folder contained within the downloaded PSP>GAME folder into the already existing PSP>GAME folder on the PSP and it works. i’m pretty new @ this stuff,i just got myself a PSP3000 and managed to install 5.03 Gen-B by following your instructions..
My problem is that I would like to play PSX games on it and i found that Popsloader existed. Everywhere i looked for,they said it was only for M33 users. I’d like to know if Popsloader exist for Gen-B 5.03 anf if yes, how to install it such that the PSX eboots play fine. Yep. Just be sure to look for POPs for GEN.
i did look for it but nearly most of all tutorials i’ve found involve turning off my psp and holding the R button for 5 seconds while rebooting…as far as i know, chickHEN R2 will be gone if i do so. Err.. *sigh* I’ll write one when I get back home tonight. And I’ll upload the necessary files for you as well. another question, if i accidentaly restarted or turned off my psp, it would go back to ofw right? should i again run chickHEN r2 and install 5.03 gen-a before going to gen-b all over? Yep. Though a lot of people seem to be having problems with getting GEN-A -> GEN-B to work. You should try ChickHen -> GEN-B if you encounter problems. The same thing happend to me, i cant install gen b now, can u please help? TRY HOLDING DA LEFT SHOULDER BUTTON WHILE LAUNCHING DA QUICK UPDATER! Will add this info to the post… thanks. I skip the GenA part and go ChickHen -> GenB. Works Great. I have 5.03 GEN-B (Full) installed and running. Only thing left is to get popsloder. I’ve searched around but all I’ve found are for m33/cfwe and 5.50 GEN. I was going to try the one for 5.50 GEN, but just want to make sure before I go and brick my PSP. I noticed you had an earlier post about writing up a guide with the necessary files. If you have done so already, may I please have the topic/link? I seem to have it working. Says it’s enabled in vsh and options come up when I hold R after loading up game. Still, a guide would be very welcome. is it possible if 5.03 GEN-B can’t play certain games that can be played at 5.50 GEN-D2? ’cause I’ve downloaded a japanese game and someone who uploaded it said she tested it on 5.50 GEN-D2 and it was working. but it’s not working on my 5.03 GEN-B. is there anyway I could make it run on 5.03 GEN-B? Hey sylv3rblade nice info here. I just pulled out my original psp (launch day model) after a long break…it currently has DA 3.03 OE-C…what would be my plan of action to get my psp up to date? Although I would recommend upgrading your firmware bit by bit to make it less of a pain to upgrade. A bit of warning, do NOT, under any circumstances upgrade to any firmware greater than 5.50 or use the network update. You’ll save yourself a lot of headaches. i try to update to gen-d .im currently using gen-b .when i run the update for gen-d my screen goes black and stays black. what am i doing wrong. I have the update folder in the X:psp/game folder and the 5.50 pbp in the root menu of my memory stick. Try updating to 5.50 GEN-B2 before updating to GEN-D. I have a psp 3000 and had installed 5.03 GEN-A. after running it, and after it does the patch and all, in the system info it says 5.03 GEN-A (full). I can play some games, but others i can’t and others don’t even appear! Please someone help me! Hope you can help me sylv3rblade! All help is welcome! pareng atma xplorer….5.03 gen-a po ung psp 3k ko…..kung uupgrade q ba sa GEN-b….gagana na ba ung mga games (nba 10, naruto shipuuden)? o kelangan parin eboot patcher?? thx! excuse poh.. safe b gawing gen-a ung psp 2k k ta088ve mobo.. coz last time i try it black screen ung psp k pero nka on… kya pingwa k n replace ng new mobo. it hurts kz mhal pll hlp me tnx. my psp is series 3000… i accidentally flashed it twice and… i think i messed up the vsh… i cant open the vsh menu… any ways to open the vsh menu again? Just turn off your PSP (to unload chickhen) and repeat the steps to install 5.03 GEN-B again. Thanks! Tekken 6 is now working properly under GEN-B! what did you do man? I just followed the instructions to the letter. Loaded ChickHEN, first installed Gen-A using the GUI installer, then installed Gen-B by copying the folder to PSP/GAME. Next I loaded Gen-A to patch, then Gen-B, then ran Tekken 6. Presto! It works! i ried installing GEN-B and it erased my cfw and i had to install chickHEN again..
and can i update my psp in 5.50gen a? how i know my psp model is v3 or v2 or v1? When you see the red screen before a PSP game loads, it means that it’s being decrypted to work for your firmware. Without, you need to manually patch games for it to work but with 5.03 GEN-B it’s automatically done for you. So yeah, it’s normal. Also v3, v2 and v1? Or are you referring to PSP-1000, -2000 and -3000 respectively? bat po ung akin na copy ku na po sa iso folder (ex. Naruto Shippuden Akatsuki Rising) ku tapos po pag punta ku sa games ku wla namn pong lumilitaw n games icon pwde pong tel me wat prob.?? Anong ang format ng file ng game (.iso or cso) at ano ang firmware ng PSP mo? Hmm sure ka na nasa X:\ISO ung folder? (X ung drive na nakikita ng PC mo ung PSP mo). Lahat ng games na sinubukan mo ayaw? but if i run same game in psp in firmware 5.03 gen a there is no any such type of red screen why this is diffence b/w gen a and gen b? 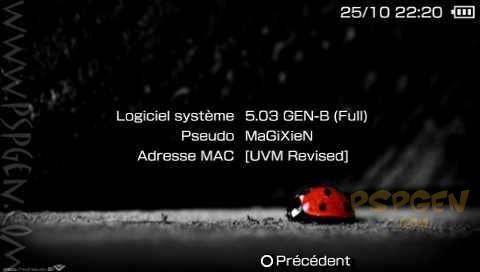 in psp firmware 5.50 gen a + gen b? it may brake my psp or my psp will work with 5.50? Don’t worry, if you post a comment in English, you’ll get a reply from me in English. so wht i have to do? i think he don’t know my psp motherboard model? and date code is 7d. so plz tell me are you sure tht i can install 5.50 gen a? it will not brake my psp? The part where it says: Is my PSP Hackable? Hmm weird, working naman dapat ung Naruto Shippuden sa 5.03 GEN-B dahil may game decrpyter na sya. oo nga eh kainis nga gus2ng gus2 ku pa namn un…ginwa ko nga reneboot ku tapos inulit kung gawin ung GEN B eh ganun parin..ayyyyyyyyy 🙁 syo b gumgana b ung Naruto Shippuden..? ?anwei sa GEN B ba pwdeng play ung PRX n games? ?wla k n bng g2wn nun?? 5.50 GEN-D ako eh and yes it works on my PSP. Baka bad copy lang. If ayaw pa din you pede mo imanual decrypt. pano imamanual?? 2ru mo namn sken para magamit ku…about sa PRX my idea kaba kung pwde?? waw pinoy ka po pala. idol, pano tong akin? psp3k tas nkachiken na ko. 5.03 GEN-A (Full) na ako..
pag ininstall ko po ba yung GEN-B makakalaro na ako ng tekken6 etc? yung mga games na nangangailangan ng 6. * na firmware? *sigh* as I’ve said I’ll reply to you in whatever language you’re posting comments. Nag download ako ngaun ng tekken 6. Im using 5.03 GEN-B firmware. Hindi ko alam bat di ako mkapag laro. nag loload lang siya palagi. di ba dapat now loading ang lalabas. sa aking 8420 lumalabas. Tapos laging nka flash ang mem stick indicator. Thanks for this sir! Very useful!I can ow play tekken 6 on my PSP 3000! I install 5.03 gen B many many times. however, it disappear whenever i drop my psp on the floor. i have the 5.03 gen B software in the memoy stick but the data is corrupted. i can’t run it. PLEASE HELP!!!!!!!!!! I have installed 5.03 GEN-B (full) onto my psp but when i try to play any isos it just says “game could not be started”. Have you changed the UMD mode on the VSH menu (press select to access it)? I have ChickHEN R2 run on my PSP3000 and 5.03 gen-B for the CFW. OFW is 5.03. After successfully run the chickHen mode and the 5.03 genB, my iso game will reset the psp each tie i tried to open it. Then i need to start with chickHen and genB again. I also intsalled the vsh and sedna. What should i do in order to play back my iso game? What games have you tried that led to your PSP resetting? Please name them. sylv3rblade can u tell me it will fix or not? i install it successful but the games are not running. i goes to error 80020321. Try using the Hellcat’s recovery tool. direcho n pong mgging 5.00 m33-6 n un? Yep. Hellcat’s will flash your firmware to 5.00 M33-6. sIr sylv3r hindi po ako sure kung ggwin ku 2ng process kc sa mga problems..
Ung 2ngkol sa ChickHEN alam ku po gawin. so PSP q po wala png custom firmware, ung ofw[version 5.03]..
kpg na install ko na ung ChickHEN R2 ,pwede ko n po ba 2ng gwin? or kailangan ko pa install ung 5.03 GEN-A at san po aq mka2kuha nun. sIr Ok n po ngawa ko na ung procedure ng 5.03 GEN-A ,tpos na try ko ung quick update ng gen-b ,tpos ok na, then na check ko ung system tpos nkalagay gen-a prin o.O bkit po ganun. question lng po, kelangan ko b mgupdate s 5.03 pra mainstall ung chickHEN? hackable ang psp q, ndi ko mainstall ung chiken, kua slyverblade, kelangan ko b muna po i-update muna pra magrun ung chiken? Yep. Specifically dapat 5.03 and firmware mo para magrun ang chickhen. Wala na bang pagasa? :c pag 5.50 official firmware? I have GEN 5.50 D-3 and my UMD ant reading our doing anything I tryed changing the options to everything just well not run at all everything works but that can ayone help????? What games are you trying to play using the UMD? Have you tried switching the UMD mode on the VSH menu? Yes I have tryed that what it was from the 1st update 3.whatever was updated it stoped working just my head hurts trying to find what if it’s something I did our with the update our what I been using it for a while like that now and have to GEN D-3 update but nothing with the umd yet…. What games on UMD are you trying to play? sir sigurado ka dun mismo…d n replace ung psp folder tama b???? what could be wrong?!?!?! is it in the recovery menu???.. I AM NOT A NEWB. As of the moment, all CFWs are banned from accessing the PSN. yah it is not set on default speed and wht abt cpu clock xmb .? wht it should be can u tell me all setting related to speed of psp? and can u tell me is there any other option due to whick my psp is not reading umds? why i m getting this error i m unable to run games from memory card i m getting this msg in many games in gta chinatown also in liberty city, god of war and burnout. Check your firmware version and post it here. Likely you’ve lost your CFW and have to reinstall again. i got prob with my psp.gen b 5.50 said my data is corrupted.and all my were not showing in my psp .what should i do? have you checked if your UMD mode is set to M33 driver? tell me wht i do? If you’re already using the M33 driver then I guess the problem lies with 5.03 GEN-C itself. I’ve checked around and there’s quite a lot of problems with it (relating to UMD games and older ISOs specifically). I’ll keep looking for a work around but it seems the likely solution is to downgrade to 5.03 GEN-B :(. Please specify the games (ISO and UMD) that are failing to work on 5.03 GEN-C. I need a help here. I got a psp 3000 gen b with the required popsloader, but I still can’t play ps1 games. When I entered the game (I tried it on RE 2 btw) it just stop on the ps1 logo. What should I do? Is it possible to hack a psp go ? pare help, ayaw gumana nung army of two saken…5.03 GEN-B na ako, bat ganun? 5.51 ung version ng system pano ko sya iddowngrade to 5.03??? can i use the 5.03???? HELP! PLEASE, i can’t download games.. e-mail nmn! sheloi_09@yahoo.com tnx! Make sure na tumatakbo ung ChickHen bago mo iinstall ung 5.03 GEN-B. Otherwise di talaga tatakbo yan. pre meron ako psp 2006 chickhen xa tapos inupgrade ko sa 5.50 gen d . pagreboot ko wala ng displau na bricked ko yata . may solution pa ba para mapagana ko ulit psp ko? Did you install the plugin that came along with the download? have u played ths game???????? I’ll upload a copy for you. tel me how to install plugin ?? and it will not break piracy?? Just copying the files won’t do anything. You need to enable the plugin. 1) In case you are already using plugins, just paste this: “ms0:/KHBBS/KHBBS_patch.prx 1” (without quotation marks) into your seplugins/game.txt. Otherwise just copy “seplugins” folder from this release to the root directory of your Memory Stick. 2) Copy “KHBBS” folder to the root directory of your Memory Stick. in both so wht to do now??? plz tell me wht can i do now? so tell me wht to do? tell me from where to download this game ? u thnk which will work? i have psp 3000. 5.03 m33-6. i have MGS Peace Walker downloaded. what do i do next to play it on my psp? thank you. mga tol kailangan b ng original na memory kc d alam kung orig 2? ayaw kc gumna ng chickHen!